Beautiful, fast and ... endangered. What can be done to save these magnificent animals from extinction? 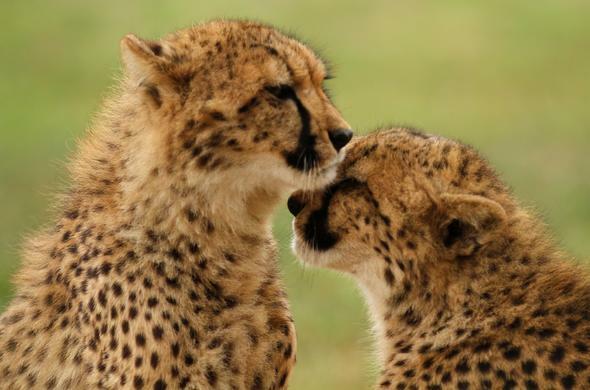 You can visit 2 innovative Cheetah projects in northern KwaZulu-Natal and enjoy personal encounters while supporting a worthy cause. The world's fastest land mammal is finding it hard to thrive under difficult circumstances. These elegant cats are not aggressive and would rather take off than fight. Cheetahs do best in areas where they can conceal themselves from other predators. Wide plains with long grass, bushes and thick vegetation are ideal but these habitats are now few and far between in the wild. Several factors contribute to the declining Cheetah population. Loss of prey, hunting and persecution from other species (including man) plus a shrinking habitat are taking their toll. Disease and high cub mortality are also major problems which stem from a reduced gene pool.As a result of inbreeding, about a third of wild male Cheetahs are born sterile and major organ failure is taking the lives of many newborn cubs. Cheetah numbers are dropping radically every year and without intervention these amazing creatures will become critically endangered. There are currently 3 Cheetahs and 2 adorable orphaned cubs at the Le Sueur Cheetah Project. The Cheetah cubs are being hand raised with a Leopard cub, 2 Serval kittens and a young Meerkat in the Cub Crèche. Each baby has come from difficult circumstances but they are now thriving due to the care and attention. You can meet and play with the cubs and also accompany the 2 Cheetah cubs on bush walks while they learn valuable life skills. The project relies on visitor fees, donations and sponsors and has its own Facebook page.